Delivering a rebranding strategy across a number of locations to a tight timescale is no mean feat. Pickfords Business Solutions and VINCI Facilities, the construction and facilities management experts were awarded ‘Best Partnership in Relocation’ at the PFM Awards 2018. TC Facilities Management (TCFM) has created a national charity partnership to help the British Heart Foundation achieve its aim of beating heartbreak forever. Focus Building Services Limited – Celebrating ten years! The ten-year anniversary party hosted at Camm & Hooper’s beautifully restored Victorian Bathhouse on the 12th July 2018 successfully concluded during the small hours of Friday morning and was enjoyed by staff, clients, suppliers and subcontractors. 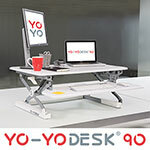 Yo-Yo Desk is a revolutionary and affordable series of Sit-Stand workstations (prices start from only £249.95 inc VAT and Shipping) designed to work with your existing desk. Following a formal and robust bid procedure lead by Martin Budd and Pat Hughes, Pickfords Business Solutions is proud to announce that the company has been awarded a place on the new moving services framework agreement issued recently by the BBC. UK Gutter Maintenance are specialists in the cleaning and maintenance of commercial, retail and industrial gutters throughout the country. The ever changing business world has seen traditional 9-5 working days being replaced with a twenty-four seven culture. The recent Facilities show proved to be a great success for us. We met a good cross section of the industry who were pleased to become aware of our comprehensive portfolio.